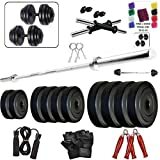 Home » Health » Bodyfit 20Kg Combo 3Ft Plain Rod Home Gym Fitness Kit. Bodyfit 20Kg Combo 3Ft Plain Rod Home Gym Fitness Kit. 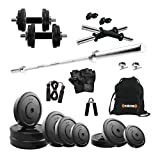 20Kg Of Weight Plates,Box Contents:20Kg Weights Plates, 1X3Ft Plain Rod, 2X14-Inch Dumbbell Rods1 Pair Hand Gripper, Locks, Gym Gloves, 1 Skipping Rope,. 1 X 3 Feet Plain Rod+ 2 X 14-Inch Dumbbell Rods. Pure Leather Gym Gloves + 1 Skipping Rope + 1 Hand Gripper Pair + 2 Locks Comes With The Rod. A Combination Of All Gym Equipments For The Perfect Workout. It Is Highly Durable And Long Lasting ,A Perfect Muscle Builder.